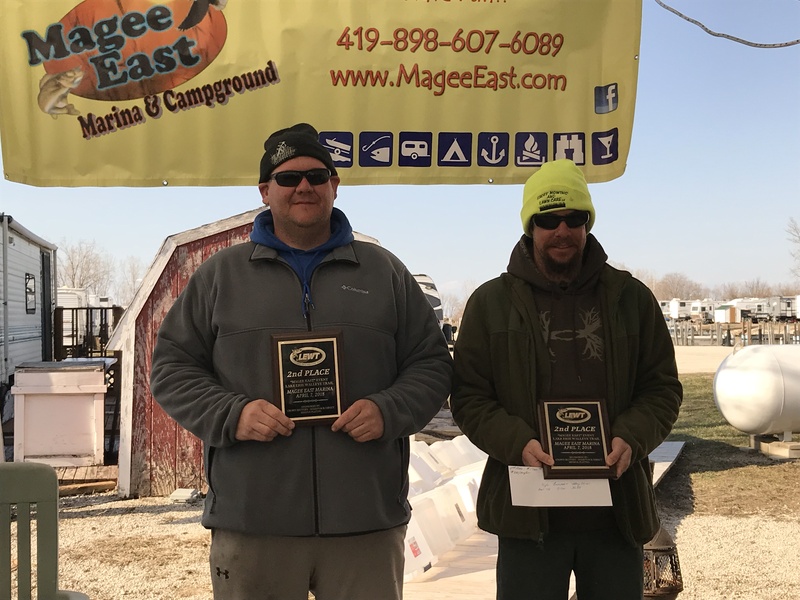 Cold temperatures and a one-day postponement due to weather couldn’t stop the Crown Battery, Sharpnack Direct, Lake Erie Walleye Trail (LEWT) season opener hosted by Magee East Marina and Campground. 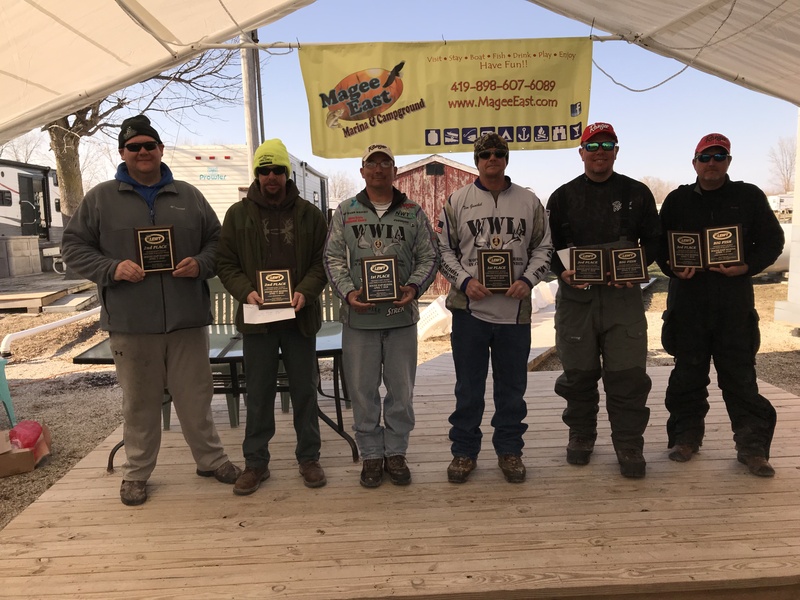 When the final results were tallied, the team of Richard Wright of Ashville, and Tim Gunckel of Greenville, took the big win and $3300 with five large walleye weighing in at 36.93 pounds. 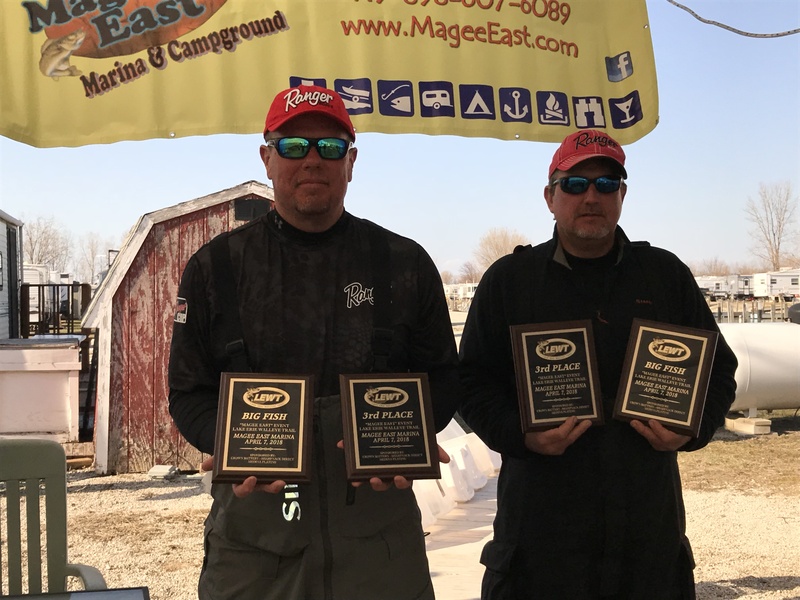 The first place Big Fish plaques and cash award of $612 went to third place finishers Bob Barnhart and Eric Van Denk for landing the largest fish of the tournament weighing in at 10.83 pounds. 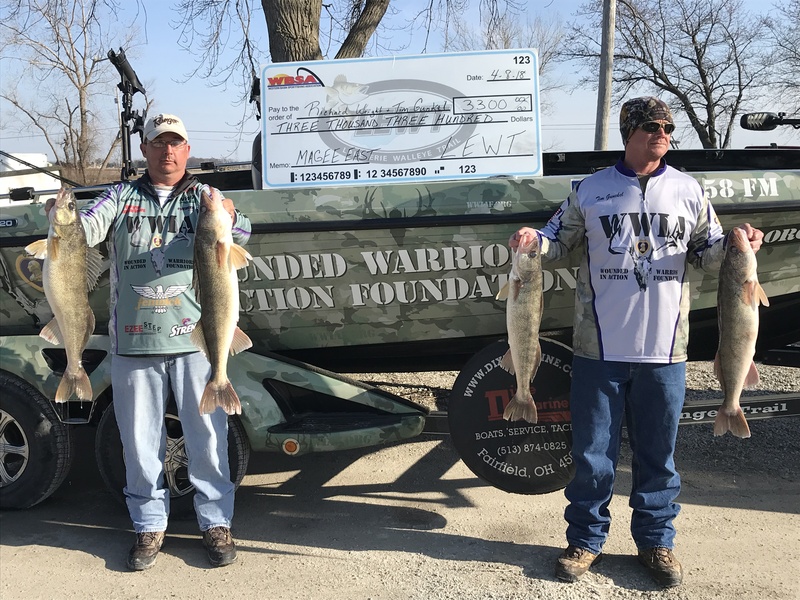 Sixth place finishers Mike Robertson and Steve Summerly recorded the second largest walleye weighing 9.71 pounds, worth $408. Richard Wright will receive $500 from Ranger Boats for his teams win at Magee East. Richard is a qualified Ranger Boat owner under the Ranger Cup program. Long time LEWT supporter Sharpnack Direct in Willard Ohio offers a cash prize to the highest finishing LEWT angler at each event who owns a new or used vehicle purchased from Sharpnack. Randy Eyre (partner Corey Miller) won the $150 cash award with a thirteenth place finish. Medina Plating sponsors our Early Bird contingency that goes to the top finishing team that entered all four events before the Early Bird deadline. Wright and Gunckel added to their take with this $150 prize. Both members of the first team out-of-the-money in 10th place won free six-month subscriptions to the Domka Outdoors Lure of the Month club. Chris Morris and Thomas Nordyke will be enjoying this prize. Huge thank you to Ted Thomas, and his friendly staff at “Magee East” for once again being a fantastic host. We had a great crowd present at the weigh-in to cheer on their favorite anglers. Most of the LEWT anglers donated their walleye catch, which will be cleaned by Lake Fish in Sandusky. These filets will be donated to the Victory Temple Soup Kitchen in Sandusky, who uses this resource to assist people in need within our own community. Please support our 2018 LEWT sponsors: Crown Battery Systems, Sharpnack Direct in Willard, Medina Plating, Magee East Campground and Marina, Ranger Boats, Waldo Peppers Restaurant, Smooth Moves, Worldwide Marine Underwriters, Reef Runner Lures, Vic’s Sports Center, Erie Outfitters, Rednek Outfitters, Hi-Way Bait Tackle and Lodging, and Domka Outdoor.